Fair Warning: The Sound Quality is poor and the recording stops abruptly as the recording situation during the third age of the Big Honkin Show was all over the place! It’s your audio cup of coffee. Steve is back on the radio in Hazlehurst, GA on a daily basis. 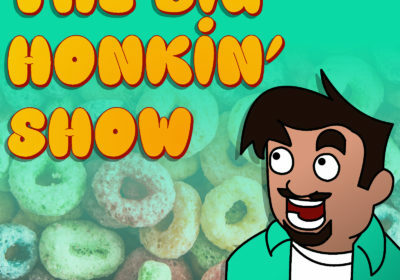 In this episode, Steve is still trying to find his way in doing two hours of the Big Honkin Show solo as well as fulfilling all the local news requirements. It was during this, the third age of The Big Honkin Show that the Twitter Zoo Crew (Later Mixlr Zoo Crew) was born. Steve discusses a county with only one qualified police officer…a dog, as he reads some local happenings Steve explains what “asked” means when making an announcement about parents staying with their kids at an events, the referee strike was on and the replacement ref controversy was in full swing and Steve has opinions, Felix Baumgartner is first talked about on the show which leads to an obsession for Steve, and Steve just tries to get people to wake up and have a good start to the day. It’s rough as Steve was trying to feel out how best to fill two hours and fit in as the official morning guy on the little radio station in the little town in south Georgia.